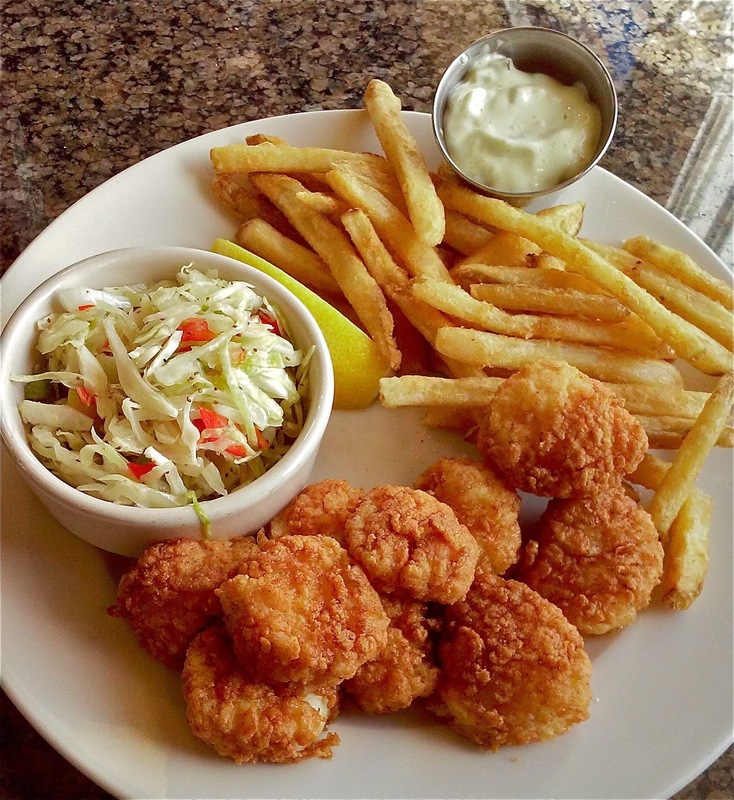 Fanizzi's "Fresh Fried Sea Scallop Plate" is served for lunch or dinner. We're so happy to have Fanizzi's up and running again after their recent 6-week closing for structural repairs to this cherished waterfront building, which literally sits right on top of Provincetown Harbor. Welcome back! 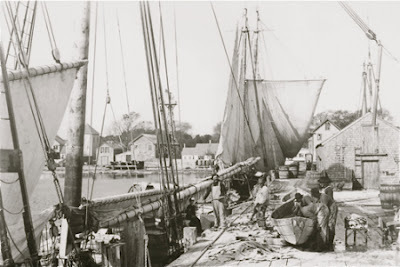 537-539 Commercial Street, where Fanizzi's restaurant and parking area sit today, was the location of a fishing empire known as Whorf's Wharf, built by Thomas Rider Whorf, Jr. in 1850, and later run by his son, Phillip A. Whorf. These Whorfs shared an ancestor, generations apart, with the artists John, Carol and Nancy Whorf, though they were not direct descendants. At one time this busy pier stretched 400 feet into the harbor, serving its own fleet of 16 boats engaged in various types of fishing, while shipping some of the catch to markets as far away as Chicago. 130 men were employed in the operation. There was a windmill on the property, presumably part of a saltworks where seawater was pumped to a system of trays and troughs. The water was evaporated to produce the salt used in drying and preserving much of the fish caught by Whorf's fleet. sail loft very likely became Fanizzi's Restaurant by the Sea, as we know it today. The wharf also had its own sail loft for fabricating and repairing the many sails for its sizable fleet, and Fanizzi's building is almost certainly that old sail loft, still sitting on pilings at the edge of the beach. The recent repairs, including new pilings installed beneath the restaurant, should ensure many more years of life for this historic building dating back to the height of Provincetown's great whaling and fishing era, often called the Golden Age of Sail. Sitting in Fanizzi's dining room, above those pilings, with the waves and tides lapping below, is one of the great pleasures of dining in Provincetown. And the view! Cape Cod Bay winds along the distant shoreline of Truro, and becomes Provincetown Harbor as it reaches the tip of the Cape and the lighthouse at Long Point. Our picturesque beaches stretch both east, with a view of Beach Point, and west, offering a striking view of the Pilgrim Monument, and often a golden glow as the sun is setting. These and other stunning sights are easily seen from your table. That superb, 180 degree view of the harbor is unparalleled. There's even a view from the bar. dinner rolls and salad, all for $13.99. Go early, before this great bargain sells out. On my most recent lunchtime visit to Fanizzi's, I felt more like having a "dinner" sort of meal, so I ordered from a selection of entrées that started at just $8.99 for Eggplant Parmigiana baked in homemade marinara sauce and a blanket of cheese, served over campanile pasta. Fanizzi's is quite well-known for good food at very reasonable prices. Big, juicy, eight-ounce Angus burgers start at $10.99, while 16 sandwiches, specialties and wraps start at $9.99. There are daily lunch and dinner specials, too. The meal I chose that day was among half-a-dozen seafood entrées on the lunch menu. I had the fried scallops, shown in the photo above. This was a generous serving of ten plump, fresh, local sea scallops, lightly battered and quickly fried until just golden brown, served with Fanizzi's great French fries and their unique coleslaw. I believe the very light dressing on the coleslaw starts with a bit of rice wine vinegar instead of a mayonnaise-based sauce. It's fresh flavors give it just a hint of sweetness, and it's probably my favorite coleslaw in town. Visit Fanizzi's at 539 Commercial Street, now open again every day, serving lunch from 11:30 AM till 3:45 PM, with dinner served from 4 PM till closing. Five Early Bird dinner specials are available from 4:30 to 6 PM for just $15.99. Catch their Friday Night Fish Fry for $13.99, and don't forget Sunday Brunch, 10 AM till 2 PM, serving all you'd care to eat for $14.95, $8.95 for kids. But be sure to save a little room for one of their mammoth-sized, homemade desserts! We welcome back Fanizzi's Restaurant by the Sea, and their thoughtful, friendly staff. always love reading your fact-filled posts, thank you!! And thank you for reading my blog. You might also enjoy reading my occasional posts at www.discoverprovincetown.com, which provides a bit of PTown history, along with information about my year-round, guided tours of Provincetown. On these tours I use vintage photographs, antique postcards and artworks to illustrate stories from our history, and to show what Provincetown was really like over the last 400 years. I hope you'll join me on a tour as well. Townies always get a deep discount on fares, and in a few weeks I'll be offering free historic tours just for Townies, so watch for my announcement. Thanks for reading my blog, and for all the pleasant times enjoying something tasty along with that stunning view of the harbor!